It's time for 'normal service' to be resumed! I have given my experiences of IPP and MPP and you all know that I had a wonderful time amongst friends and may have managed to pick up a special puzzle or two. I do plan on reviewing these over time but also want to continue to discuss the puzzles that the "normal" puzzler in the street can obtain. I am sure that there will be more tales of puzzle parties from the other bloggers soon and Rox has already begun her series of posts. Today it is back to my slowly diminishing hoard from Puzzle Master. I do actually plan on eventually getting the entire series of Hanayama puzzles and each order I place with them always includes a few more. This time I am discussing the Cast O'Gear - a really lovely little puzzle designed (as many seem to be) by the hugely talented Oskar van Deventer, whom I was very pleased to meet in the flesh last week, and originally called the Sunflower. In fact, it won an Honorable Mention in the 2001 Puzzle Design Competition at the International Puzzle Party. Just like all the Hanayama puzzles distributed in the West, it comes in the lovely black box with the instructions simply to take it apart and put it back together again. I think it is one of their most attractive designs, being made in the antiqued bronze like finish. It has a nice heft to it and measures 7.9 x 7 x 3.5cm making this a pleasant one to manipulate and allows a decent examination to establish the probable mechanism. Hanayama have rated this as a level 3 out of 6 which Puzzle Master agrees with as a level 7 (Challenging) on their scale of 5 to 10 and I would agree with this rating. I seem to have come very late to this party as almost everyone else in the world has solved and reviewed it before me (Gabriel, Neil, Oli, Brian and Will have posted at these links). No solution is provided but if you need one then it can be downloaded from here. In my own puzzle database I have classified this as a Maze or route finding type puzzle but I guess it could also be placed in the sequential movement group too. The movement is really quite fun to play with and it does remind me of a cog on a bicycle. 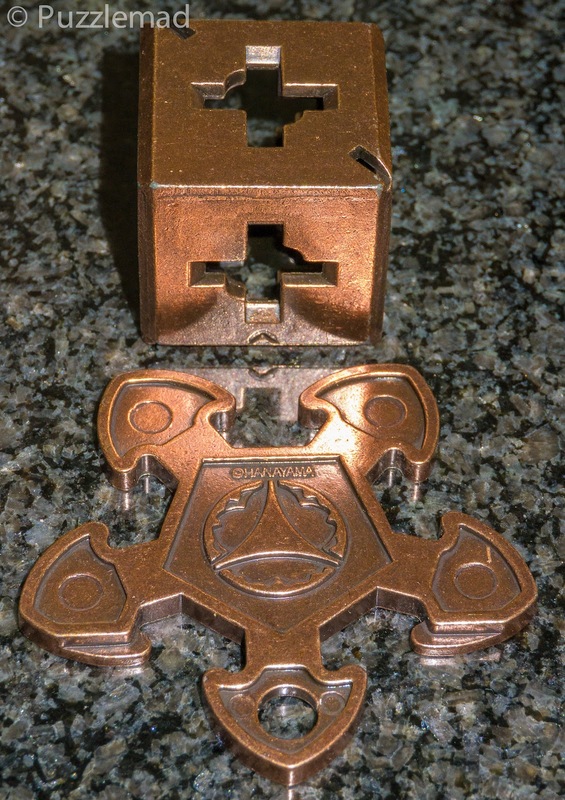 If you lift the gear/cog off the cube face then it can be twisted through 90º to point a different direction but it can ONLY be twisted back and forth through that range which limits any further moves. Having decided which face you wish to point it at then it will roll around to the next face and the teeth of the gear will engage with the new side and release from the top (or wherever you have it). At each face you get another chance to rotate though 90º before rolling it to another face. Not all faces can accept the gear from every direction due to subtle differences in the shape of the holes in the cube. The aim is to remove the gear and for this to happen you either do it by pure blind luck (which might take quite some time) or, as is intended, you examine it closely to notice subtle differences between teeth of the gear and the holes in the cube and determine a plan for where/how they will separate and aim to get there deliberately. After my initial experimentation I had formulated a plan but the actual process of achieving it really took me quite some time! I was able to get to the correct face quite easily but the gear was pointing the wrong direction and would not come out. Several times I got the gear to an adjacent face and had it all correctly oriented but the required move was blocked! Infuriating! I found myself going round and round and round in circles desperately trying to change the orientation of the gear but not managing to do it! Plus of course, after I had tried a few sequences to remedy the situation, I had forgotten what I had tried and I'm sure I repeated the same sequence many times! I'm definitely not very bright! I put it down, had a coffee and thought about it for a while. Next time I picked it up, I tried a new sequence and had the gear in the right place and yay! it would rotate to face the correct direction and I gave it a tug but it didn't separate! I was sure that I was correct but kept fiddling with it and was delighted to see that the pieces separated in a (to me) rather unexpected motion. I have to say that is very clever! My goodness! That took me a very long time! I put it down and took my photos and then worked to reverse the process. Of course I had absolutely no idea what sequence I had done - I must have used nearly 200 moves in my first solve - the solution does it in just 10 moves. I was very encouraged that after about 20 odd moves I had the gear back on top and tried to set it into the grooves that mark the top surface and leave it held in a nice display position. It turned the appropriate 45º and oh no! The grooves were offset from the centre position and I had it completely the wrong way around! OK, maybe rolling it around the cube will fix this? Nope! It took me even longer to get back to the beginning than it had to do my initial solve. This is an easy puzzle to understand but a very tough one to solve by planning ahead. I have now done it 3 or 4 times and have still not quite got it learned properly. I am certainly getting my money's worth out of this one - it's a great deal at only $13. Symmple puzzle is not simple! I also have a lovely little bonus to share with you. I participated in the IPP puzzle exchange as an assistant for Dr Goetz Schwandtner and was bowled over by the exchangers' generosity and the incredible puzzles they were just giving away. Allard was also giving away an extra little gift to the exchange assistants along with his main puzzle. 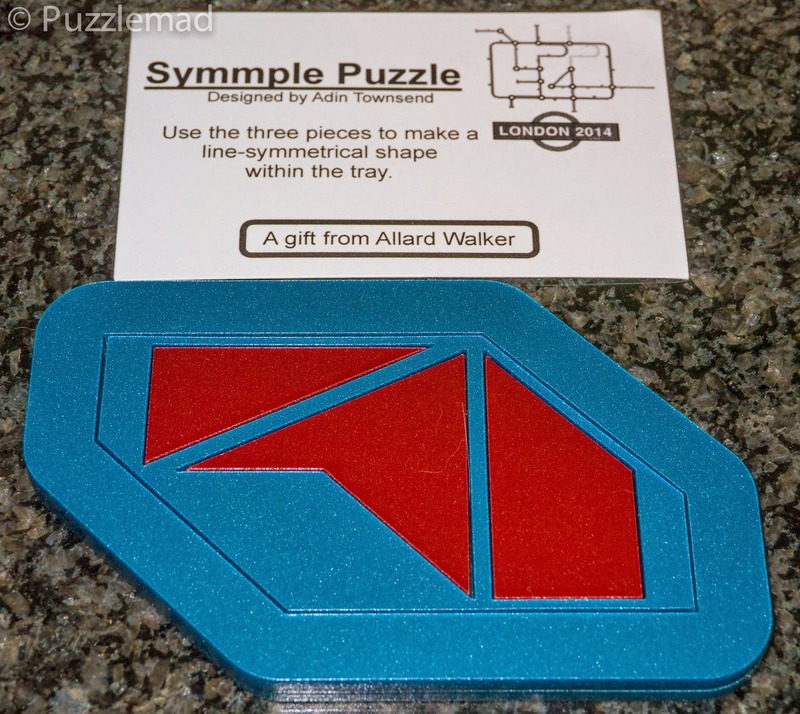 The Symmple Puzzle is only simple in idea! It was designed by my good friend Adin Townsend. I regularly meet Adin and his gorgeous fiancé at MPP and often communicate with them through Facebook. 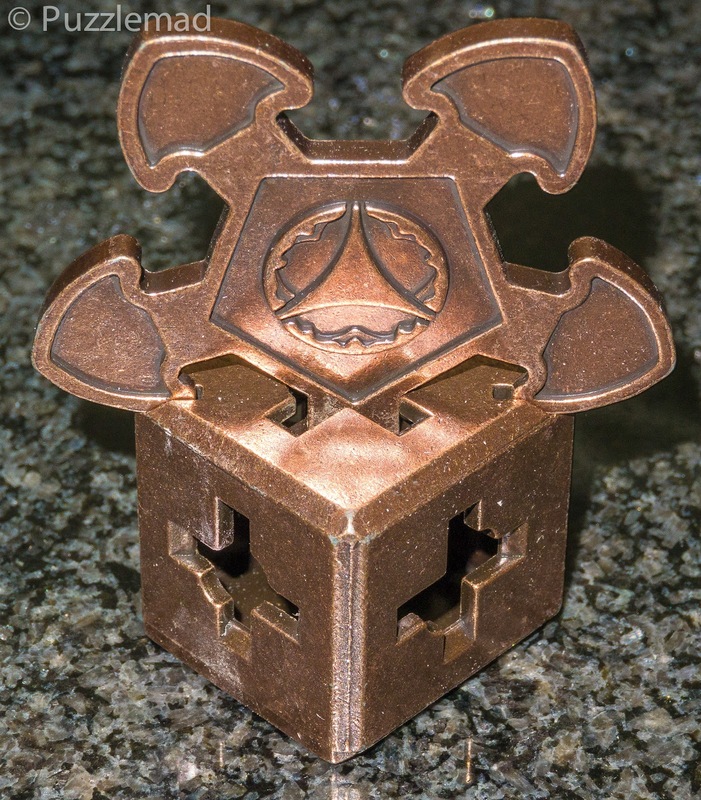 Adin has recently begun designing his own puzzles and also has taken up woodwork with some amazing initial results. I was very keen to give this little freebie a try because many people at and after IPP had reported how difficult it was. 3 easy pieces? Hell no! It's nicely made in bright plastic and very portable - I do plan on torturing surgeons, anaesthetic trainees and medical students with it as well as my poor consultant colleagues! Everything is held nicely within the frame but after removing the frame the aim is to make a shape with a "line symmetry" that fits back inside the tray. I'm rubbish at symmetry puzzles (Tomas Linden's Symmetrick puzzle took me ages to solve) and I'm also terrible at packing puzzles but I had to see what all the hype was about! It's a lovely thing to explore and I was able to make several symmetric shapes but none would fit in the tray. Then I made something quite simple that looked symmetrical AND fit in the tray but I know Adin and he is more sneaky than that! Looking closely at what I had made, I realised that it was not a reflectional/line symmetry - it was only a rotational symmetry! Now I was stumped and had to think of more unusual shapes. Staring at it whilst pouring a pre-dinner drinkie, I had a sudden flash of brilliance and made a new shape. Yesss! It was symmetrical and fit the tray! Absolutely stunning puzzle - thanks Adin and Allard! PS. I have to inform the world that Allard has said that it took him months to find the solution! I hope that was because he had so many other puzzles to play with? I'm sure he's brighter than that! Let the torturing begin! I'll let you know what happens. 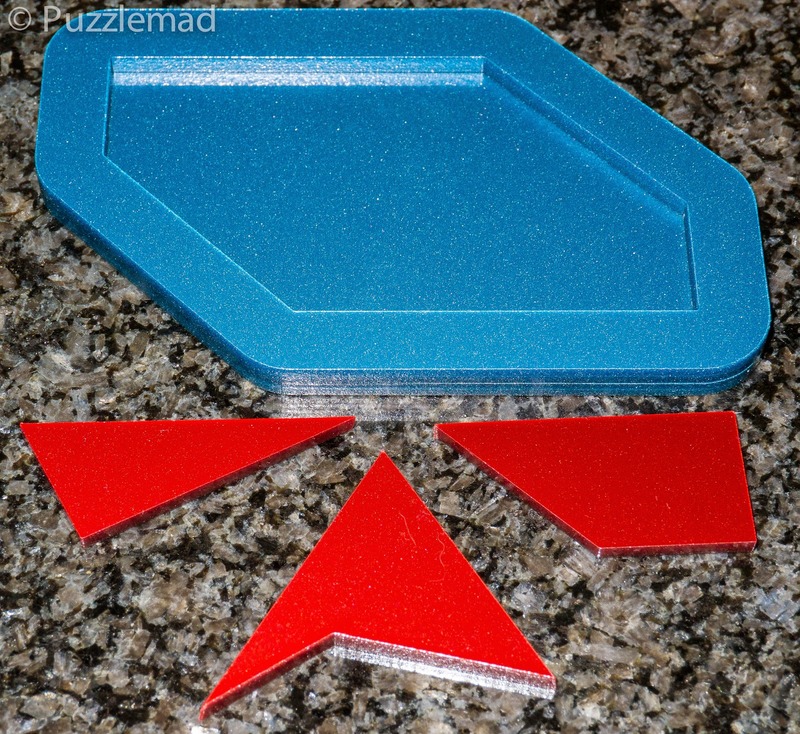 It is very clever - the pieces fit in the tray very easily but almost all the symmetries are blocked and there's a shape that looks like a symmetry but isn't. Totally unique idea! Anybody know why it is "Cast O'Gear" instead of just "Cast Gear". Oskar isn't Irish, I don't think. That's a good question! I have no idea - I wonder whether it's related to the hole in one of the sprockets? If anyone knows, please leave a reply!